LICKING COUNTY, OH (WCMH) -- Troopers found a gun and thousands of dollars worth of meth during a traffic stop in Licking County, recently. According to the OSHP, at about 11:50pm, April 6, troopers stopped a 2001 Ford Ranger with Ohio registration for a lane violation on I-70 in Licking County. Troopers say the driver, Jermanine Green, 38, of Zanesville was impaired and charged him with OVI. 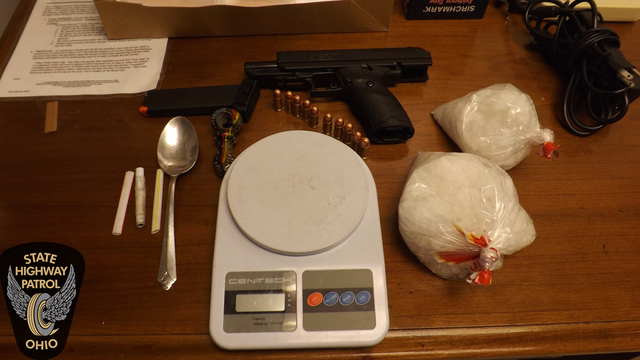 During a search of the vehicle, troopers found a loaded JHP .45 caliber handgun, and more than one pound of methamphetamine worth approximately $10,000, according to the OSHP. Green was charged with possession of drugs, weapons under disability, and improper handling of a firearm. If convicted, Green faces up to 15 years in prison and a $35,000 fine.